(14809, Heye Foundation Collection, OHS). Located in Tulsa County on U.S. Highway 169 (the Mingo Valley Expressway), six miles north of Tulsa's city limits, Owasso began as a settlement in 1881 in the Cooweescoowee District of the Cherokee Nation, Indian Territory. 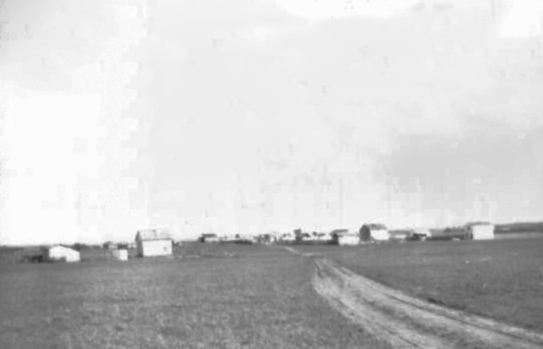 The community became known as Elm Creek settlement because it was located along Elm Creek, a tributary of Bird Creek. The first settler was H. T. (Tole) Richardson. By 1893 Elm Creek comprised several residences, a blacksmith shop, and Preston Ballard's general store. He received a postal designation for Elm Creek on February 10, 1898, with himself as postmaster. The Joseph T. Barnes family moved to the community in 1897; Barnes purchased the blacksmith shop in 1898. In 1897 the Kansas, Oklahoma Central and Southwestern Railway acquired right-of-way near the fledgling town. They dammed a natural spring to form a lake as a water supply and built a depot about a mile south of the lake. The depot was razed in 1942. Because the rail line missed Elm Creek, its residents and businesses began moving their buildings to the area around the depot. Late in 1898 Joseph and Luther Barnes moved their blacksmith shop to the new community. The shop became the Joseph Barnes family's temporary home and was the first residence officially moved to the new town site. Preston Ballard moved his general store and post office at about the same time. The new place kept the name Elm Creek, as did the post office. The postal designation was changed to Owasso on January 24, 1900. There is some confusion as to whether Owasso is an Osage or a Cherokee word. However, it has been interpreted to mean "the end" or "the turn around" because the rail line ended there. The steam locomotives obtained their water at the lake and were turned around near the depot, returning north. The tracks were extended into Tulsa in 1905. On March 26, 1904, the secretary of the interior approved a plat for the town of Owasso, and the town soon incorporated. Originally the streets were named for Civil War–era Union and Confederate generals but were renamed in 1960. By 1907 statehood Owasso supported a population of 379 but more than three times that number lived in the surrounding area. The residents patronized hardware, drug, grocery, and general merchandise stores, three hotels, a bank, lumber companies, and numerous professionals. Two grain elevators, a cotton gin, a stockyards and livestock auction, and grain and feed stores served farmers. The 1910 population stood at 373, and the 1930 census counted 416 residents. The Owasso Ledger printed the news in the early twentieth century, and later news media included the Owasson and the Owasso Reporter, which continues in publication. Owasso's business district and the community continued to grow. On February 6, 1905, the town council granted a franchise to the Pioneer Telephone and Telegraph Company for the first telephone exchange. At about the same time, oil was discovered in the area, and the community experienced an oil and natural gas boom. Prosperity continued until about 1929, the beginning of the Great Depression. As roads were built and the railway improved, people began going to Tulsa, just twelve miles away, for their business needs. The town's population decreased, and business establishments were abandoned, torn down, or burned and were not replaced. In the 1940s only a dozen enterprises operated, and by 1950 the population stood at 431. Then in 1952 rapid growth began as transportation access allowed industry to develop in the nearby area and residents to commute to jobs. The first new tract addition (Raywood) of sixty-eight homes was established in 1952. Owasso quickly became a "bedroom" community for Tulsa, which was rapidly growing northward. By 1955 the number of retail outlets doubled. The downtown buildings were connected to a new sewer line on July 1, 1953. The Port of Catoosa, the nation's most inland water port, was completed southeast of town in 1971, and the Tulsa International Airport, to the south, grew larger as well, adding to the available amenities and employment opportunities. The 1960 census registered 2,032 residents. Due in part to proximity to Tulsa and to small-town atmosphere, Owasso has sustained a pattern of steady growth. In June 1973 the city annexed 555 acres, doubling its size. The 1970 population of 3,491 expanded to 6,487 in 1980 and 11,151 in 1990. Industrial development proceeded through the 1980s and 1990s, and factories included American Airlines, with nine thousand employees, Nordam Group, with seventeen hundred, and Whirlpool, with twelve hundred. Telecommunications provider MCI WorldCom employed twenty-two hundred. The Owasso School District operates thirteen schools and is also a major employer. On September 28, 1972, the Town of Owasso became the City of Owasso. It maintains a council-manager form of government. In 2000 the population stood at 18,502 and in 2010 at 28,915. An annual festival, Progress Days, was created in 1953 and continued into the twenty-first century as Trail Days. "Owasso," Vertical File, Owasso Historical Museum, Owasso. "Owasso," Vertical File, Research Division, Oklahoma Historical Society, Oklahoma City. Karen Shade, "Owasso Centennial: Owasso Has Come a Long Way Since Its Beginnings as Elm Creek" Tulsa (Oklahoma) World, 30 June 2004. David J. McDonough and Marcia Boutwell, "Owasso," The Encyclopedia of Oklahoma History and Culture, https://www.okhistory.org/publications/enc/entry.php?entry=OW001.